I love books. I love the smell of books, I love to flip the pages on my fingers, I love closing the book when I’m done. So, let me count thy ways that made me fall in love with interacting with a digital book. Especially with Charlotte Mason homeschooling, which tends to rely heavily on classic works that can often be free on Kindle, I spend pennies on the dollar versus a print book. Plus, when I borrow a digital book at the library, I never get late fines! Serious win! I hate to waste, and especially if I’m going to only read a book once, I don’t want to waste that paper. No trees had to die for the production of the book, and the electrical cost is minute. Even if I’m going to use the book many times, there comes a point when it’s just no longer relevant and would be thrown out. Digital trash doesn’t take up any space at the landfill. I just updated our homeschool room (which you may already know, if you follow me on Instagram), and I was quite surprised how fast I filled up our bookshelves. How am I supposed to homeschool for 16 more years, in sha Allah, with this limited space? I already have a number of books on the Kindle, and with the Kindle Fire, I can read full color books without losing out on the pictures. Win-win. But other than saving space on my bookshelves, I also can bring my whole digital library with me wherever I go. Traveling and waiting at swimming lessons are both times when I want to pack light, but have something available to read. I usually like to have at least two choices, and yet I don’t have any extra bulk. When we went camping this summer, I just brought my Kindle with and had a library of kids’ books to read for bedtime stories. I write in many of my books, especially non-fiction. I want to be an active reader. While reading Charlotte Mason’s Home Education with a group, I highlighted as I read, and then on the FREE Kindle reading app I was able to see all my notes in one place, without having to flip back and forth. I also bought Building Foundations of Scientific Understanding in Kindle format and I highlight in different colors, make notes with website links, and it’s been great to mark up the book, but not permanently. If you really want to mark up a book, I do suggest using the free Kindle app on a laptop or desktop. There have been so many times that I remember a phrase from a book that I want to talk about with someone, like Charlotte Mason’s quote, “One time is not as good as another” and yet I needed to give more context for someone else to understand what I mean. The search feature has really come in handy many times, and there’s just no way to do that with a printed book. I also know people who buy reference books in Kindle format so they can search for words or phrases. For instance Robert Tisserand’s Essential Oil Safety book (a must-have for the oil enthusiast) is a beast in print, but if you’re looking for something specific, the search feature on the Kindle version is a life saver! This is mostly in reference to my Kindle Fire, though you can send a PDF to a black and white Kindle also. I have started sending tatting or knitting patterns to my Kindle Fire so I don’t have to bring pattern sheets with me and worry about them getting all wrinkled, or lost. One thing I wish I would have gotten more early on with my Kindle Paperwhite (my favorite Kindle because it doesn’t cause eye strain, and yet I can read it in the dark) is that I didn’t get a screen protector or a cover right away. Within a week I had a scratch on my screen that will never go away. It’s not terrible, but no matter what I’m reading, the damage is there, unlike a print book. I started with the Kindle Keyboard nearly 7 years ago, which now my husband uses when he’s at work, or when we travel. After I was spending hours nursing in the dark and the Kindle Paperwhite came out, I jumped on that. Nursing at night now had some benefit! The kids did really well sharing tablets we borrowed from the library, so for Eid we bought them one Kids Kindle Fire to share. This year with new homeschooling needs like watching YouTube videos for our Arabic folk songs, reading books and maintaining color pictures, and doing quick searches for science, I decided that buying myself a Kindle Fire was a good idea. It has been really helpful for our homeschool, for crafting patterns, and let’s face it, watching streaming video in bed when I want to hide from the kids. 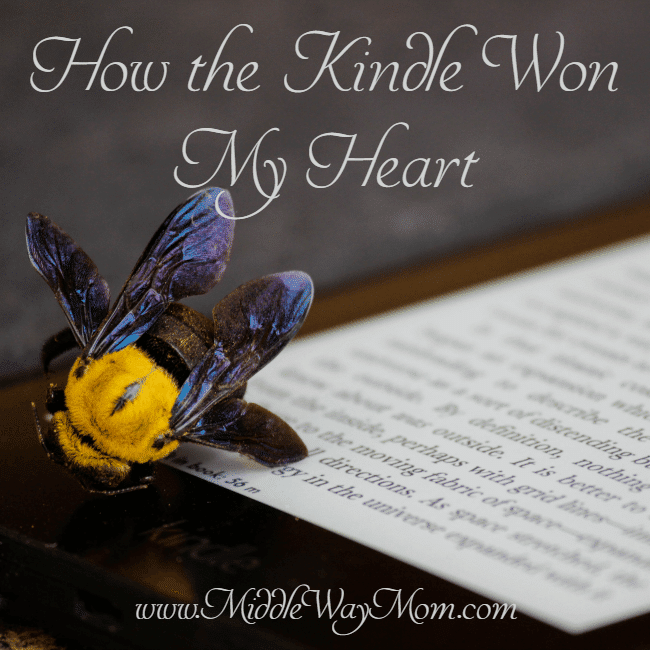 Do you own a Kindle? How much do you love it? Or not? I didn’t even think about no library fine! I may borrow a lot more digitally now.